James Bond-style drama: "It was arranged for him to receive a sizeable cash donation during his stay at the London Metropole Hotel, Edgware Road, London between August 11, 2003, and August 16, 2003. Alamoudi told Special Branch [for National Terrorist Financial Investigations Unit, United Kingdom] officers that on the morning of Wednesday, August 13, 2003, he received a telephone call to his room from someone who spoke Arabic with a Libyan accent, informing him he had 'something' for him. The individual arrived at Alamoudi's room and handed him a small 'Samsonite' style briefcase. Alamoudi said there was no conversation and the visitor abruptly left Alamoudi's room. Upon opening the case he discovered $340,000 of United States currency." Mickey Mouse-style drama: Just yesterday, when Alamoudi returned to Dulles airport outside of Washington, D.C., from a seven-country, month-long trip, he tried to hide his travel to five of those seven countries in the most primitive way. He used a U.S. passport for England and Saudi Arabia; and a Yemeni passport for travel to Lebanon, Syria, Yemen, Egypt, and Libya. When he arrived at Dulles, Alamoudi was questioned by Senior Customs and Border Protection Officer Wesley Hartman. During that questioning, Alamoudi was twice asked what countries he had visited on this trip. Both times he responded that he only visited England and Saudi Arabia. After the CBP Officer began to review his three passports, they again asked what countries he had visited on this trip. Alamoudi stated that he had also visited Lebanon, Syria, and Yemen during this trip. He concealed the fact that, after visiting those countries, he had also visited Libya and Egypt." Speculation on Alamoudi's continued connection to the AMC: "Although Alamoudi is not named on the corporate records for AMC beyond 2000, I [the Immigration and Customs Enforcement who wrote the complaint] have probable cause … to believe that Alamoudi remained in a leadership capacity with AMC." (This confirms an April 2003 report in the New York Sun which found that Alamoudi continued to fill official positions at the AMC (as both chairman of its Imam Conference and president of the American Muslim Foundation). The Sun article quotes Steven Emerson saying that "He was never gone. The guy was always there. They hoodwinked the director of the FBI, it worked, and now they've abandoned pretending that they've changed their stripes." Insight into the foreign funding of Islamist organizations in the United States: The complaint paraphrases what Alamoudi wrote to Mohamed Ahmed Al-Sharif, head of Libya's World Islamic Call Society in a March 2003 letter. Alamoudi announces in it that he was "able to buy a building in May 2002 to be a permanent quarters for the AMC, the AMF [American Muslim Foundation] and the Hajj Foundation. The purchase price was $2.5 million dollars and the value of the real estate in March 2003 was described as $3.5 million. According to the letter, the building was acquired by three loans two of which, from Islamic Development Bank and SEDCO (Saudi Economic Development Co.) were interest-free. The third loan was interest free for six months. The letter solicited Al-Sharif to assist in paying the loan which would bear interest or taking an equity stake in the realty." The "constant struggle" of funding an Islamist organization: Having sugar-daddies like Saudi Arabia, Iran, and Libya would seem to be proof against financial worries, but Alamoudi suggested otherwise when asked by British law enforcement on August 11, 2003: "Alamoudi was interviewed by officers of the Special Branch. He stated that he is the President of the AMF [American Muslim Foundation] and that financing the organization's work is a constant struggle." 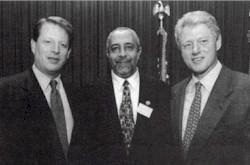 Abdurahman Alamoudi in better times, with U.S. president Clinton and vice president Gore. Oct. 28, 2003 update: The Boston Herald reports today that "Alamoudi's Palm Pilot, seized in August by British police who stopped him from boarding a plane to Syria with the $340,000 in a suitcase, contained the names of seven men designated by the U.S. government as global terrorists." It names three of those "global terrorists": Yassin al-Qadi, Youssef M. Nada, and Ahmed Nasreddin. The Herald also reports on meetings and other contact between Alamoudi and top leaders of Hamas. To this mounting evidence, Maher Hanania, one of Alamoudi's lawyers (and another partner of Kamal Nawash; on whom, see http://www.danielpipes.org/blog/2003/09/kamal-nawash.html) derided the prosecution as politically motivated and offered a deliciously mixed metaphor to make his point about the prosecutors' efforts: "They're fishing up the wrong tree." Oct. 29, 2003 update: The government also found an unsigned document in Arabic during a search of al-Amoudi's office in Virginia, reports the Associated Press today. It makes many references to Hamas and discusses "execution of operations against the Israelis to delay the peace process." NANCY HANKS CT., 6325 - Yusef A. Khatib to Abdurahman M. Alamoudi, $380,000. There could, of course, be other Abdurahman M. Alamoudis than the one who is the subject of this weblog entry, but the chances are pretty good that this purchaser is the man who's been in prison the past half year. And supposing it is, one can't help but wonder what he is doing buying a house for $380,000 even as he languishes in the Big House. Mar. 30, 2004 update: Federal authorities have nearly doubled the charges against Alamoudi, from 18 to 34, reports the Associated Press, meaning he could be sentenced to as many as 105 years in jail. June 10, 2004 update: There is so much taking place that I wrote an article on this topic, "Qaddafi's American Hit Man?" In addition, here is some important information from a Wall Street Journal story by Glenn R. Simpson, "U.S. Investigates Suspected Plot to Kill Saudi Ruler." The Justice Department has revealed several facts in court filings: (1) it possesses a handwritten document in Arabic from Alamoudi's office in Falls Church, Va. that contains extensive references to the operations of Hamas; (2) Alamoudi controlled "Happy Hearts Trust," an Isle of Man-registered entity suspected of being one of the Herndon-SAAR organizations that (with a name like that, wouldn't you know?) funded terrorism; (3) Alamoudi's five brothers in Saudi Arabia sent him over $500,000 in recent years; (4) the American Muslim Council received an interest-free loan in 2002 from the Saudi Economic Development Corp., which is controlled by a branch of the Mahfouz family, a prominent Saudi banking clan.. The alleged plot could roil Saudi politics. The Justice Department is investigating whether Mr. Alamoudi was working with a London-based Saudi dissident group known as the Movement for Islamic Reform in Arabia, which the Saudi royal family accuses of links to Osama bin Laden. Prominent Saudis who have given financial support to Mr. Alamoudi and the group he founded, the American Muslim Council, may find themselves at risk of suspicion of disloyalty. The Alamoudi case also could generate tensions between the Saudi regime and the Muslim Brotherhood, a global fundamentalist society with strong support among the Saudi populace. The AMC was founded by a senior member of the Brotherhood, and prosecutors also accuse Mr. Alamoudi of being a member of the organization. Finally, Simpson writes that Alamoudi "is negotiating an agreement with prosecutors under which he would exchange what he knows for a shorter prison sentence," so we eventually could have all this information and more out and officially on the record. June 11, 2004 update: IslamOnline.net carries Alamoudi's response to the New York Times article, acknowledging Qaddafi's intention to murder Abdullah but denying his own part in the plot. In response to a question carried by an advisor, Ashraf Nubani, he said that Qaddafi "wanted to kill the Saudi crown prince." Nubani added that "Amoudi does not want to kill anyone." For the past six months or so, I had information that Col. Muammar Qaddafi was hatching a conspiracy to assassinate His Highness Crown Prince Abdullah. When I raised the issue with official friends, I understood they had the information from sources other than mine. However, I wasn't given any details for obvious reasons. Libya was in contact with Saudi dissidents who have threatened violence against the Saudi royal family. We raised those concerns directly with Libyan leadership and they assured us that they would not support the use of violence for settling political differences with any state. Boucher goes on to note that this subject was raised "a number of times by U.S. diplomats in meetings with Libyan officials" in late 2003, starting at one of the U.S.-U.K.-Libyan meetings in London. In early 2004, assistant secretary of state for Near Eastern Affairs William Burns brought up the issue of "using violence for political ends" directly met with Qaddafi "and again, received the assurances." June 18, 2004 update: For a Saudi take on this imbroglio, see today's coverage in Al-Yaqeen. contend that a Libyan intelligence officer, Col. Mohamed Ismael, working under the cover of a charitable foundation in Tripoli, the World Islamic Call Society, came to London at least four times last year to meet with Faqih to discuss a plot to kill Abdullah and other members of the royal family. The sessions were allegedly arranged by Abdurahman Alamoudi, an American Muslim leader based in Northern Virginia. During the meetings, the Saudis contend, Ismael gave Faqih 1 million euros (about $1.2 million) for his broadcast activities and personal use. At the final session last October, they allege, Faqih gave Ismael the names of four radicals in Saudi Arabia who he said would carry out the assassinations. By this account, about $1 million was transferred into the country through a travel company in Mecca, which was told the money was for the use of Gaddafi's wife during a pilgrimage there. But the Saudis had monitored the London meetings and were able to arrest the suspected radicals before they could carry out the attacks. Ismael fled to Cairo, where he was arrested and returned to Riyadh. Alamoudi was stopped by British authorities last August with $340,000 inside a valise and the following month was arrested in the United States when he returned there. According to documents filed with the State of Virginia Corporation Commission, UASR's board of directors also includes Abdurahman Alamoudi, who was indicted last October for alleged illegal dealings with Libya. Court documents filed in Virginia and obtained by CNSNews.com indicate that a government investigation of Alamoudi has uncovered evidence linking him to al Qaeda through a non-profit called the Taibah International Aid Association (TIAA), based in Falls Church, Va. "According to TIAA's 2000 IRS Form 990, Abdurahman Alamoudi is the Vice President of TIAA," the court documents stated. TIAA, founded in 1991, also "lists Abdullah A. bin Laden, as founding officer." He is the nephew of Osama bin Laden, according to the U.S. Justice Department. The court documents filed by the U.S. attorney's office in Virginia stated that Mohammed El-Nagmy, an employee of TIAA and its sister organization Taibah in Sarajevo, Bosnia, served simultaneously as the Bosnian representative for the Global Relief Foundation (GRF). GRF is also on the State Department's list of specially designated global terrorist groups. "GRF ... personnel had multiple contacts with Wadih El-Hage, UBL's [Osama bin Laden] personal secretary when UBL was in Sudan," according to the U.S. Treasury Department. El-Hage was convicted in May 2001 for his role in the 1998 U.S. embassy bombings. Comment: As the Alamoudi saga unfolds, the full extent of his far-ranging links is coming to light. July 30, 2004 update: "Mr. Alamoudi plans to plead guilty on Friday to three charges related to illegal business dealings with Libya, failure to disclose past international contacts when he became a naturalized citizen and a tax-related offense," reports the New York Times. His lawyer, Stanley Cohen, assures that "Abdurahman acknowledges that he was involved in a situation that was very harmful to Saudi interests, and he is extraordinarily contrite and ashamed about it, and he's conflicted and confused as to how this all came to pass." Well, he'll have plenty of time in the Big House to figure that one out. Aug. 3, 2004 update: A weblog not being enough to cover the extraordinary Alamoudi case, I have for the second time written an article on this topic, "Slick Islamist Heads to Jail." (On the first, see the reference above, at the June 10, 2004 update.) In it, I consider this leading Islamist's fall from grace and its implications for the many government agencies which worked with him. Whether Alamoudi will actually serve the 23 years is questionable. His plea agreement contemplates cooperation with the government. If he provides truthful information or testimony that helps the government further investigations -- particularly terrorism cases -- he could become eligible for a significant reduction. Time will tell. Alamoudi will be serving time at U.S. Penitentiary McCreary in McCreary, Kentucky. Jan. 7, 2005 update: Putting a coda on this whole sordid business, a British court today impounded the $340,000 seized from Alamoudi back in August 2003. The UK authorities indicated this amounted to the single largest seizure in their country of cash for terrorism. Mar. 12, 2005 update: Saudi sources cited by Craig Whitlock in the Washington Post today provide more information about the Libyan plot to assassinate Crown Prince Abdullah in which Alamoudi took part. Specifically, they conclude that the plan to kill the prince was done to seem to be an Al-Qaeda-backed domestic insurgency. According to an unnamed senior Saudi official, the idea was to make everything "look like it was done against the government by the people of Saudi Arabia." Despite its Keystone Cops quality, the plot was broken up only days before it was to have been carried out in November 2003, when Libyan operatives were caught delivering more than $1 million in cash at a hotel in Mecca to Saudi dissidents. They were then supposed to launch grenades and other explosives into Abdullah's residence in Mecca. The thirteen suspects (eight Saudis and five Libyans) are slated soon to go on trial. The goal of the assassination plot? To destabilize Saudi Arabia and perhaps overthrow the House of Saud. Riyadh responded on Dec. 22, 2004, by announcing the expulsion of Libya's ambassador and the withdrawal of its ambassador from Tripoli. This decision was ascribed by Foreign Minister Saud ibn Faisal to the "ugliness" surrounding the assassination attempt. In 2003, MIRA and Faqih received approximately $1 million in funding through Abdulrahman Alamoudi. According to information available to the U.S. Government, the September 2003 arrest of Alamoudi was a severe blow to al Qaida, as Alamoudi had a close relationship with al Qaida and had raised money for al Qaida in the United States. July 16, 2005 update: Others too noted the above paragraph connecting Alamoudi to Al-Qaeda. Mary Beth Sheridan has an article on the subject in today's Washington Post (but only available reprinted in other papers) in which she flat-out states that this is the "first time" U.S. authorities have made the Alamoudi-Al-Qaeda link, noting that, "If accurate, the new allegation would mark a stunning revelation about a man who for years served as a liaison between American Muslims and the U.S. government." She also adds an important explanation of how this new charge came about: "one U.S. official, speaking on condition of anonymity because of the sensitivity of the matter, said the allegation was based on new information that went beyond what was disclosed during Alamoudi's trial in U.S. District Court in Alexandria." July 29, 2005 update: In an affidavit attached to the Sept. 29, 2003, criminal complaint charging Alamoudi with the Libya-related transactions, we learn today from Bloomberg, two major U.S. financial corporations were party to his mischief. Citigroup Inc. and American Express Co. performed the funds transfers and processed the charge card payments. … Citigroup accepted Libyan government funds for Alamoudi's Washington-based American Muslim Foundation in 1999 and 2000, and Amex processed Alamoudi's payments for two airplane tickets to Libya from Zurich in 2000 and 2001, the complaint says. At the time, U.S. law prohibited American citizens from purchasing travel to Libya and from having financial dealings with Libyan government entities without U.S. government permission. Alamoudi's case shows how the biggest U.S. financial companies and their regulators can fail to protect the banking system from abuse by people engaged in political violence, money laundering or terrorism. … There's no indication in public Treasury Department records that Citigroup, the biggest U.S. financial services company, or American Express, the world's biggest travel agency, is being punished. In the Citigroup funds transfers, the Libyan mission to the United Nations wired $5,000 on Dec. 3, 1999, from its bank account to a Citibank account held by the American Muslim Foundation, of which Alamoudi was founder and president, according to the criminal complaint. In November 2000, the Libyan mission to the UN wrote a $2,000 check from its bank account to the American Muslim Foundation, which deposited the money in its Citibank account. The American Muslim Foundation reported a $5,000 donation from the Libyan mission to the UN in its tax return for 1999, the same year in which Citigroup accepted the $5,000 wire transfer. Comment: Giant corporations tend to see themselves as citizens of the world, leading to this sort of consequence for domestic security. Bloomberg also reports that Alamoudi's lawyer, Stanley Cohen, explained his client's motive in serving an a middleman for murder: "He thought it was a way to get some money for his organizations." Given that those organizations were the American Muslim Council and related groups, that sounds entirely fitting to me. June 26, 2006 update: Alamoudi's plea agreement called for him to forfeit $910,000 to the U.S. government, that being the estimated proceeds from his criminal activities. The government took $340,000 from his baggage but, unable to find the rest of his loot, took three real estate parcels he owned, plus an automobile to make up for the missing $570,000. Alamoudi claimed that its doing so was illegal, saying that his plea bargain deal did not authorize a substitute forfeiture. A three-judge panel of the 4th U.S. Circuit Court of Appeals today unanimously rejected his argument. Oct. 27, 2008 update: Note the sale of a house in Fairfax, Va., to Alamoudi for $380,000 at the Mar. 25, 2004 update, above, because it is back in the news. Josh Gerstein reports that the U.S. Court of Appeals for the 4th Circuit yesterday that the government has the right to seize that Fairfax property as part of its punishment of Alamoudi. Her lawyer, Henry Fitzgerald, told me Alhindi came to America for treatment of an incurable muscle disease and got help from Alamoudi, who agreed to assist her in buying a house. Ultimately, the lawyer said, Alhindi's name was left off the paperwork because lenders said they wouldn't write a mortgage with her name on it. Alhindi said she put up $3000 in earnest money and made payments on the mortgage, but Alamoudi didn't formally deed the house over to her until after he was sentenced. At a hearing held to discuss Alhindi's claim to the house, Alamoudi took the Fifth Amendment. Fitzgerald claimed the purchase arrangement gave Alhindi "equitable title" to the home, but the three-judge panel agreed with the trial court's decision that the home effectively belonged to the government because the money Alamoudi used to buy it was ill gotten. … Alhindi was ordered evicted from the home back in March of last year. July 8, 2011 update: In a surprise move, federal prosecutors asked U.S. District Judge Claude Hilton to reduce Alamoudi's sentence. The reasons and the size of the cut are both under seal but speculation concerns the possibility of his giving information the U.S. government useful in the course of its war fighting in Libya. July 25, 2011 update: Hilton acceded to the prosecutors and reduced Alamoudi's sentence by 79 months, or just under 7 years. The reasons remain under seal. Alamoudi, should be freed in under a decade.